I've got a sample of this amazing mask from my cousin, Paula about 2 weeks ago. And I'm in love with it! Just last night, I tried a different approach on it. I washed my face, spread on the mask, and waited for 10 minutes and washed it off and went straight to bed. I usually put on a moisturizer after I wash my face but this mask left my face smooth and velvety to the touch. No signs of dryness or tightness. Woke today and my face is still smooth to the touch, I'm actually touching my face right now and it feels just like a baby's bottom. Anyways, I suggest this mask for all skin types. I do suggest leaving it on 5-10 minutes because I tried it overnight and it didn't leave my face with the same results BUT it did leave my face more toned looking. In just one use you will notice your face looks more awake and refreshed as it did with mine. But I guess to each their own and this is my own. You don't need a lot for your face since it's not your usual clay mask, it's in a gel form. And yes, there are real rose petals in this mask! It smells lovely and it goes on smooth and evenly. 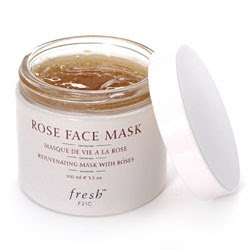 "Rose Face Mask is a hydrating and toning gel mask that restores suppleness and radiance to the skin. The first-of-its-kindformula contains real rose petals that literally melt into your skin. The formula contains 50% pure rose floral water and is enriched with cucumber extract, rose oil, aloe vera, and porphyridium cruentum (a "smart" algae that seeks out the areas of your skin that needs moisture the most). " i LOVE most products by fresh! i'll have to pick up that mask next time i'm in sephora. thanks for the tip, she! where's this giveaway you're talkin so much about, btw? ?